Orchard Girl Scouts was designed to host websites for each Girl Scout Troop at The Orchard School in Indianapolis. Each troop uses the website to communicate information to parents and scouts. To accomplish this, WordPress is used in its “multisite” configuration such that each troop has its own sub-domain (e.g., troop90.orchardgirlscouts.org) which hosts an independent instance of WordPress for that troop alone. 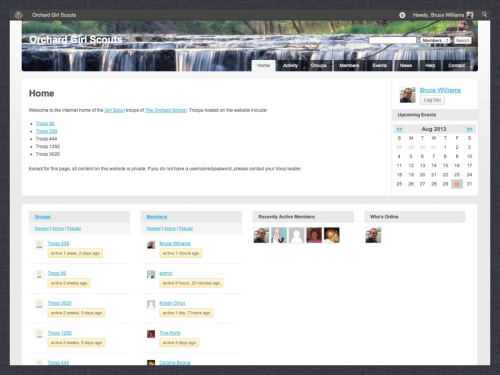 The site uses the default WordPress Twenty Ten theme as functionality, rather than style, was paramount. The Member Access plugin was used to restrict access to sensitive information about the troops by anyone other than parents of the scouts.